Mental and physical fatigue can be hugely draining on your body and often leads to a depletion of serotonin and other key chemicals in the brain. Ever woken up in a bit of a grump after a night out drinking? Or taken a few days to get back to your normal self? This is due to an influx of free radicals in the body brought on by alcohol. These unpaired electrons cause havoc at a cellular level as well as depleting GABA and serotonin levels within the body. Low levels of magnesium can cause a wide variety of health issues. This dietary mineral is essential for over 300 enzymatic reactions within the body, many of which directly affect our neurotransmitters leading to depression and insomnia. One international study showed that higher rates of depression and even suicide were seen in areas where magnesium is deficient in the diet. Magnesium is found in dried beans, nuts, whole wheat and collard greens. Which type and how should I take it? Magnesium comes in many different forms, however, for use in health and wellness there are two key forms you need to know about. Magnesium Chloride - This is the purest form of Magnesium available. Sourced from an ancient sea floor, it has avoided all the contamination commonly associated with industrialisation. The crystal like flakes are solid at room temperature but quickly melt into an oil like substance when in contact with the skin. This can then be absorbed through a transdermal action. One of the most popular ways to use magnesium chloride is to add around 150g to your bath water. Be sure to allow time for the crystals to dissolve before you get in as they can be quite sharp on a bare bottom! The magnesium will have an extremely relaxing effect on the body, leaving muscles feeling relaxed and helping to induce a good night's sleep. Magnesium citrate - Magnesium citrate is a mix of Magnesium and citric acid that is easily absorbed by the body. It is the most commonly found form of magnesium in supplement form and is safe for both children and adults. 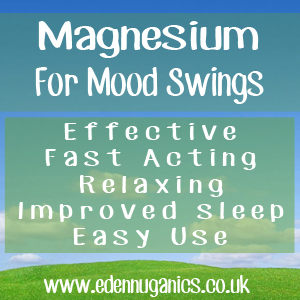 Magnesium: The most powerful natural relaxant available. Other natural remedies for mood swings? Ginseng - Often used for its energy boosting properties this ancient herb has been used for over 2000 years and is known to play a role in emotional well being. Simply boil ginseng root in water and drink once called for fast effective relief. Rhodiola Rosea - Sometime referred to as 'nature's antidepressant,' this little known herb native to Siberia has proven highly beneficial for people with hormonal imbalances. In this manner, it may help to decrease stress, improve appetite and reduce irritability. Kava Kava - This plant has been used for centuries in the South Pacific islands as a ceremonial drink. It is highly effective at calming the central nervous system, providing an overall sense of relaxation and relief to the body. Kava Kava is illegal in some countries, so be sure to check before making online purchases.